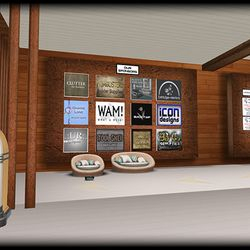 We hold competitions for builders of all levels using any combination of prims, sculpts and mesh to create buildings and installations based on a theme. They are held monthly and dates are announced in the Group notices or on our website calendar. In the past we have had themes based on Windmill Homes, Las Vegas, Science Fiction and depending on the date can relate to seasonal holidays ie. Christmas and Halloween. We sometimes hold impromptu or one-off Build Offs at any time of the month where the theme is announced prior to the Build Off. In the past we have had an Engineering theme to build a 'Stephenson's Rocket' steam engine train, NASA Spaceship craft, Bridges, and creative inspiration builds based on RL photographs. When a Build Off is announced in a group notice you will be notified about the theme, dates, start & finish times, prim count/land impact, you can then register on the Lower Platform by pressing the 'Registration Board' (registration is free and open to anyone in the group). When the build off is due to start you can choose a platform by clicking the board in front of it to show your profile picture. At the end of the competition your build is judged either by Judges or Group votes then the winner gets a prize along with their builds picture and a mention on the Winners page of the website, if you prefer not to have your build picture on the website you must contact Rottin Dean to notify the web designer of your decision. It is free to join the competitions and it is advised to join the group to receive the most current updates (if a group fee was paid it can be refunded contact Rottin Dean). 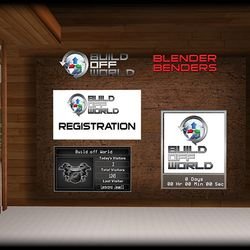 There are some great prizes to be won from Build Off World and our Sponsors and it is a great opportunity to build regularly, meet and learn from other fellow builders. From basic to advanced our blender classes held by Graham Dartmouth teach you how to use the free 3D program BLENDER to create objects, avatars and clothing. 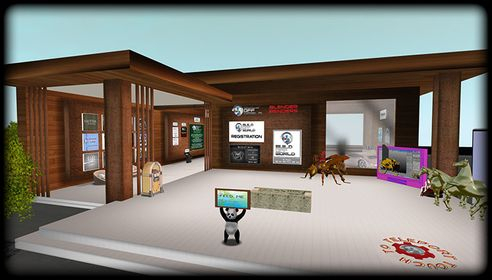 No skill levels are required and we offer a combination of in-world classes and peer-to-peer assistance. 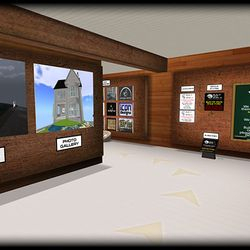 There are two classes to choose from, Blender Classes for Beginners is for people that want to learn Blender to make simple objects for upload into SL and is held on Fridays at 2pm slt. Blender Classes for the Advanced (but anyone is still welcome) is for people who attended Graham's classes in the past or who already have a good understanding of how to use Blender UI and want to further their skills for uploading more complicated objects into SL, and are held on Tuesdays at 2pm slt. The classroom is located on the upper platform. 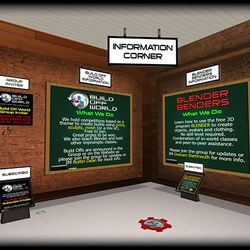 Join the Blender Benders group or Subscribo which is in the information corner on the lower platform 􀀃 to get updates about when classes are held or check our website (link below) for any changes to days and times and check the calendar for dates and times of the classes. Contact Graham Dartmouth if you need more information. We regularly hold other impromptu or one-off classes offering demonstrations, tips and tricks to help make your building experience better. Visit our website calendar to see dates of upcoming events, news, winner announcements and our photo gallery. 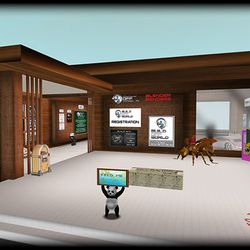 Contact Rottin Dean in Second Life for an invite to the group to be able to join in the building competitions or visit the Lower Platform to join our Subscribo which is a great way of receiving our latest news and information without having to be in the group.